LibreOffice is a StarOffice. The LibreOffice suite comprises programs to do word processing, spreadsheets, slideshows, diagrams and drawings, maintain databases, and compose mathematical formulae. 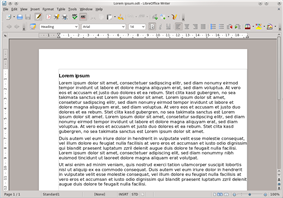 LibreOffice uses the international Apache OpenOffice and NeoOffice). The OpenDocument file format is now also supported by all major competing office suite applications (proprietary and open source). LibreOffice is also compatible with other major office suites, including Microsoft Office, through a variety of import/export filters. The file formats of Microsoft Office are well supported, though some layout features and formatting attributes are handled differently in the application or are not entirely supported in the filters. LibreOffice is available in over 110 languages and for a variety of computing platforms, including Microsoft Windows, Mac OS X 10.6 Snow Leopard or newer, and Linux. It is the default office suite of most popular Linux distributions. Between January 2011 (the first stable release) and October 2011, LibreOffice was downloaded approximately 7.5 million times. During 2012, the office suite was downloaded about 15 million times and in 2013 it was downloaded 25 million times. Writer A word processor with similar functionality and file support to Microsoft Word or WordPerfect. It has extensive WYSIWYG word processing capabilities, but can also be used as a basic text editor. 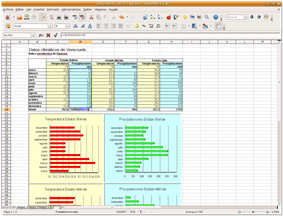 Calc A spreadsheet program, similar to Microsoft Excel or Lotus 1-2-3. It has a number of unique features, including a system which automatically defines series of graphs, based on information available to the user. Impress A presentation program resembling Microsoft PowerPoint. Presentations can be exported as SWF files, allowing them to be viewed on any computer with Adobe Flash installed. Draw A vector graphics editor and diagramming tool similar to Microsoft Visio and comparable in features to early versions of CorelDRAW. It provides connectors between shapes, which are available in a range of line styles and facilitate building drawings such as flowcharts. It also includes features similar to desktop publishing software such as Scribus and Microsoft Publisher. Math Math: An application designed for creating and editing mathematical formulae. The application uses a variant of XML for creating formulas, as defined in the OpenDocument specification. These formulas can be incorporated into other documents in the LibreOffice suite, such as those created by Writer or Calc, by embedding the formulas into the document. Base A database management program, similar to Microsoft Access. LibreOffice Base allows the creation and management of databases, preparation of forms and reports that provide end users easy access to data. Like Access, it can be used to create small embedded databases that are stored with the document files (using Java-based HSQLDB as its storage engine), and for more demanding tasks it can also be used as a front-end for various database systems, including Access databases (JET), ODBC/JDBC data sources, and MySQL, MariaDB, PostgreSQL or Microsoft Access. LibreOffice is officially developed for Microsoft Windows (IA-32), Linux (IA-32 and x86-64) and OS X (IA-32). Community ports for FreeBSD, NetBSD, and OpenBSD are maintained by contributors to those projects, respectively. A community port for OpenIndiana is in development. In 2011, plans were announced to port LibreOffice to both Android and iOS. A-EON Technology announced in 2012 that a port of LibreOffice is underway for their AmigaOne X1000 computer running the latest AmigaOS. 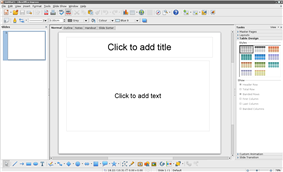 LibreOffice Online will allow for the use of LibreOffice through a web browser by using the canvas element of HTML5. Development was announced in October 2011 and is ongoing. It has not yet been released. 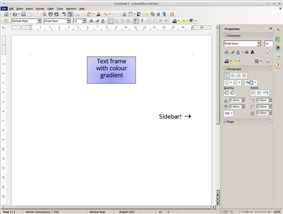 LibreOffice can use the GStreamer multimedia framework in Linux to render multimedia content such as videos in Impress and other programs. Visually, LibreOffice uses the large "Tango style" icons that are used for the application shortcuts, quick launch icons, icons for associated files and for the icons found on the toolbar of the LibreOffice programs. They are also used on the toolbars and menus by default. LibreOffice also ships with a modified theme which looks native on GTK-based Linux distributions. It also renders fonts via Cairo on Linux distributions; this means that text in LibreOffice is rendered the same as the rest of the Linux desktop. LibreOffice has a feature similar to WordArt called Fontwork. The LibreOffice project uses a dual Apache Software Foundation, there is an ongoing effort to get all the code rebased to ease future license updates. At the same time, there were complaints that IBM had not in fact released the Lotus Symphony code as open source, despite having claimed to. It was reported that some LibreOffice developers wanted to incorporate some code parts and bug fixes which IBM already fixed in their OpenOffice fork. LibreOffice Basic is a programming language similar to Microsoft Visual Basic for Applications (VBA) but based on StarOffice Basic. It is available in Writer, Calc and Base. It is used to write small programs known as "macros", with each macro performing a different task, such as counting the words in a paragraph. LibreOffice supports third-party extensions. As of June 2013, the LibreOffice Extension Repository lists more than 190 extensions. Another list is maintained by Apache OpenOffice and one by the Free Software Foundation. ^ a b "Release Notes". ^ "[Libreoffice-qa] [ANN] LIbreOffice 4.4.0 Beta1 available". 2014-11-22. Retrieved 2014-11-27. ^ "[Libreoffice-qa] [ANN] LIbreOffice 4.2.7 RC1 available". 2014-10-06. Retrieved 2014-10-11. ^ a b c d e f g h i j k l m n "4.0 New Features and Fixes » LibreOffice". LibreOffice.org. Archived from the original on 8 March 2013. Retrieved 29 May 2013. 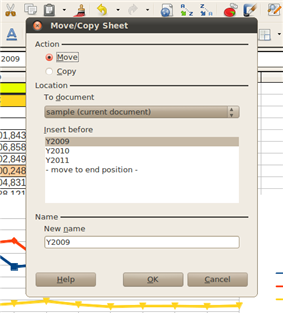 Dropped support for export to legacy Word and Excel (version 6.0/95) files. ^ "System Requirements" (Uses CSS3). ^ a b "Productivity Suite Download". ^ "Debian - Details of package libreoffice in wheezy". ^ "LibreOffice Productivity Suite Download". Retrieved 2014-02-16. ^ a b c d e f "Features". ^ "About Converting Microsoft Office Documents". LibreOffice Help. The Document Foundation. 2013-04-08. Retrieved 2014-02-16. ^ "Available Languages". The Document Foundation. Retrieved 2014-02-16. ^ "Office and productivity features". ^ "openSUSE 11.4 Will Be First To Roll Out With LibreOffice". openSUSE news. ^ Iain Thomson. "On its first birthday, LibreOffice has reason to celebrate". Retrieved 28 September 2011. ^ Italo Vignoli. "TDF In 2012: A Summary". Retrieved 26 December 2012. ^ a b Meeks, Michael. "The spreadsheet is dead. Long live the spreadsheet!". Hexus. Retrieved 7 May 2014. ^ "LibreOffice Calc". Libreoffice.org. Retrieved 24 November 2014. ^ "LibreOffice Impress". Libreoffice.org. Retrieved 24 November 2014. ^ "LibreOffice Draw". Libreoffice.org. Retrieved 24 November 2014. ^ "LibreOffice Math". 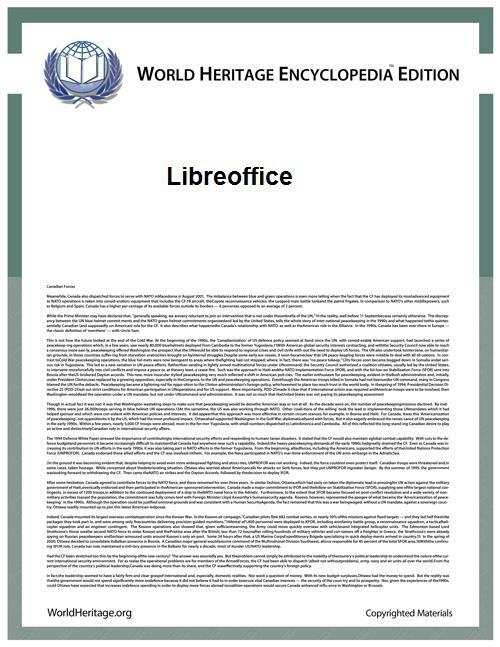 Libreoffice.org. Retrieved 24 November 2014. ^ "LibreOffice Base". The Document Foundation. Retrieved 24 November 2014. ^ "FreeBSD Ports: Editors". FreeBSD. 16 June 2013. Retrieved 16 June 2013. ^ "The NetBSD Packages Collection: misc/libreoffice". Ftp.netbsd.org. 18 March 2010. Retrieved 24 June 2013. ^ "office". Redports. 30 October 2013. Retrieved 3 November 2013. ^ The OpenBSD port of LibreOffice is being maintained by Robert Nagy in collaboration with The Document Foundation. ^ "LibreOffice was ported to OpenBSD in time for the 4.9 release". Openbsd.org. 1 May 2011. Retrieved 15 February 2012. ^ Tribble, Peter (6 June 2013). "[oi-dev] Stalled on getting LibreOffice to work". developer mailing list. OpenIndana. Retrieved 20 October 2013. ^ a b c Paul, Ryan. "LibreOffice gaining momentum, heading to Android, iOS, and the Web". Retrieved 17 October 2011. ^ "Libre Office Development Announced For AmigaOS". Retrieved 21 October 2012. ^ a b c d e f Strba, Fridrich (2013-06-21). "LibreOffice import filter for legacy Mac file-formats - smile and say "mwaw"!". Retrieved 2014-03-04. ^ a b c d "File formats – Apache OpenOffice.org Wiki". Wiki.services.openoffice.org. Retrieved 18 November 2011. ^ About.Com - PCT File. Retrieved 12 January 2014. ^ a b Thomson, Iain (14 February 2012). "LibreOffice debugs and buffs up to v.3.5". The Register. Retrieved 15 February 2012. ^ a b c d Florian Effenberger (25 January 2011). "The Document Foundation launches LibreOffice 3.3". Blog.documentfoundation.org. Retrieved 16 November 2011. ^ Phipps, Simon (17 August 2012). "How Microsoft was forced to open Office". ^ "Tango style OpenOffice.org". Tango.freedesktop.org. 12 September 2008. Retrieved 16 November 2011. ^ "OpenOffice.org 3.0 icons". Ui.openoffice.org. Retrieved 16 November 2011. ^ a b c "LibreOffice 3.4 New Features and Fixes". ^ "Fontwork For Graphical Text Art". LibreOffice. ^ Corbet, Jonathan (16 January 2013). "A discordant symphony". ^ Bain, Mark Alexander. "An introduction to OpenOffice.org Basic". NewsForge. Retrieved 3 March 2007. ^ Bergmann, Stephan (7 July 2006). ".oxt, .uno.pkg, .zip". dev@extensions.openoffice.org mailing list. http://wayback.archive.org/web/20090505232034/http://extensions.openoffice.org/servlets/ReadMsg?listName=dev&msgNo=142. Retrieved 10 August 2007. ^ "Extension - LibreOffice: Extension". The Document Foundation. Retrieved 4 January 2014. ^ "Apache OpenOffice Extensions". Apache OpenOffice. Retrieved 4 January 2014. ^ "SUN MICROSYSTEMS OPEN SOURCES STAROFFICE TECHNOLOGY". Sun Microsystems. 19 July 2000. Retrieved 19 January 2012. ^ "The OpenOffice.org Foundation". Sun Microsystems. 4 November 2001. Retrieved 9 October 2013. ^ James, Daniel (7 May 2007). "Meek not geek - Interview with Michael Meeks of OpenOffice.org". Tux Deluxe. Retrieved 1 October 2013. ^ Meeks, Michael (21–24 July 2004). John W. Lockhart, ed. "Proceedings of the Linux Symposium" (PDF). Linux Symposium 2004 2. Ottawa, Ontario. pp. 361–366. Retrieved 1 October 2013. ^ Meeks, Michael (28 January 2005). "ooo-build 1.3.8 Announced". LWN.net. Retrieved 1 October 2013. ^ Hillesley, Richard (29 January 2009). "Healthcheck: OpenOffice: Calling a cat a dog". The H Open. p. 4. Archived from the original on 8 December 2013. Retrieved 26 June 2013. ^ Meeks, Michael (10 October 2008). "Measuring the true success of OpenOffice.org". Stuff Michael Meeks is doing. People.gnome.org. Retrieved 5 January 2013. ^ Yoshida, Kohei (2 October 2007). "History of Calc Solver". Roundtrip to Shanghai via Tokyo. Retrieved 3 January 2013. ^ Schestowitz, Roy (28 September 2010). "LibreOffice is Launched, Offering Independence from Oracle". TechRights. Retrieved 8 October 2013. ^ Wallen, Jack (7 September 2010). "Could Oracle fracture open source community?". ZDNet. Retrieved 8 October 2013. ^ Noyes, Katherine (23 August 2010). "Don't Count on Oracle to Keep OpenOffice.org Alive". PC World Linux Line. IDG. Retrieved 12 October 2014. ^ Hillesley, Richard (28 September 2010). "LibreOffice - A fresh page for OpenOffice". The H Online. Heinz Heise. Archived from the original on 6 December 2013. Retrieved 7 October 2010. ^ van der Meijs, Sander (30 September 2010). "OpenOffice-coup al jaren in de maak" [OpenOffice coup years in the making]. WebWereld (in Dutch). Retrieved 6 July 2013. ^ The Document Foundation (28 September 2010). "OpenOffice.org Community announces The Document Foundation". documentfoundation.org. Archived from the original on 30 September 2010. Retrieved 9 November 2011. ^ Collins, Barry. "OpenOffice group breaks away from Oracle". PC Pro. Retrieved 9 November 2011. ^ Clarke, Gavin. "OpenOffice files Oracle divorce papers". The Register. Retrieved 9 November 2011. ^ Paul, Ryan. "Document Foundation forks OpenOffice.org, liberates it from Oracle". Ars Technica. Retrieved 9 November 2011. ^ Schulz, Charles-H. (28 September 2010). "Give up spoon-feeding: Use a fork instead.". Standards and Freedom (blog). Retrieved 7 October 2013. ^ Jake Edge (28 September 2010). "Michael Meeks talks about LibreOffice and the Document Foundation". Linux Weekly News. ^ "OpenOffice.org Community announces The Document Foundation". ^ Paul, Ryan. "Oracle wants LibreOffice members to leave OOo council". Ars Technica. Retrieved 23 February 2011. ^ Effenberger, Florian (6 December 2010). "LibreOffice development extends to Brazil". Blog. The Document Foundation. Retrieved 29 May 2012. ^ Paul, Ryan (April 2011). "Oracle gives up on OpenOffice after community forks the project". ^ "Statements on OpenOffice.org Contribution to Apache" (Press release). Oracle Corporation. 1 June 2011. Retrieved 14 October 2011. ^ Edge, Jake. "Mark Shuttleworth on companies and free software". LWN. Retrieved 7 May 2014. ^ "LibreOffice foundation gets boost with three new members". Itwire.com. 6 July 2013. Retrieved 12 August 2013. ^ Simon Phipps (2014-03-13). "LibreOffice Gets Fresh and Stable". ComputerworldUK. Retrieved 2014-04-02. ^ "Release Plan". The Document Foundation Wiki. Retrieved 25 March 2011. ^ Ihlenfeld, Jens (2010-10-15). "Zweite Beta des Openoffice.org-Forks Libreoffice" (in German). Golem.de. Retrieved 2014-03-04. ^ Camen, Kroc (2011-01-25). "The Document Foundation Launches LibreOffice 3.3". OSNews Inc. Retrieved 2014-03-04. ^ a b c d e Brinkmann, Martin (2013-07-25). "Two days after OpenOffice 4, LibreOffice 4.1 is released". Retrieved 2014-03-04. ^ "Release Notes 3.4". The Document Foundation Wiki. ^ a b c "The Document Foundation Announces LibreOffice 3.4.0". The Document Foundation Blog. ^ Meeks, Michael (2011-05-09). "LibreOffice is the future of Free Software Office suites". /people.gnome.org/~michael/blog. gnome.org. Retrieved 2014-03-04. ^ "v3.5 release notes". The Document Foundation Wiki. ^ Noyes, Katherine (23 January 2012). "10 Things to Look Forward to in LibreOffice 3.5". ^ Gorman, Michael (2012-02-14). 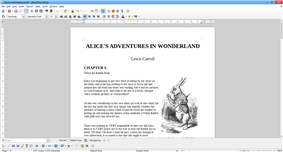 "LibreOffice updates to version 3.5, brings grammar check, bigger Calc workbooks, and more". ^ "3.6 New Features and Updates". ^ "The Document Foundation Announces LibreOffice 4.0". Blog. ^ "LibreOffice 4.0 ReleaseNotes". The Document Foundation. 2014-02-15. Retrieved 2014-03-04. ^ "LibreOffice 4.0 RC1 supports Firefox-compatible themes". ^ Jan Holesovsky (Kendy) (2013-01-10). "LibreOffice 4.0: Use Firefox Personas in your favorite office suite". Artax (Linux server) at the Karlin computer lab, Faculty of Math and Physics. ^ "Release Plan / 4.1". Wiki. ^ a b "LibreOffice 4.1 ReleaseNotes". The Document Foundation. 30 July 2013. Retrieved 12 August 2013. ^ a b c d Scherschel, Fabian (2013-05-28). 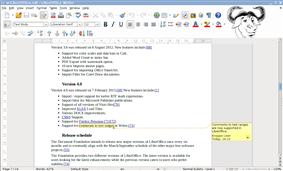 "LibreOffice 4.1.0 Beta 1 arrives with over a thousand changes". ^ Dj Walker-Morgan (2013-06-24). "LibreOffice 4.1's first release candidate arrives". ^ The Document Foundation: LibreOffice 4.2 ReleaseNotes. ^ "Shared formula to reduce memory usage". 2013-08-15. Retrieved 2014-03-04. ^ Larabel, Michael (2013-10-29). "LibreOffice Lands A Ton Of GPU OpenCL Functions". ^ "Libreoffice 4.4 Release Notes". The Document Foundation. ^ a b "The Document Foundation celebrates its first anniversary". The Document Foundation Blog. Retrieved 28 September 2011. ^ "Watch out Microsoft, Collabora is bringing value added LibreOffice". Muktware. Retrieved 4 January 2014. ^ de Lima, Francival Rodrigues. "Histórico do BrOffice.org no SERPRO" (PDF) (in Portuguese). Softwarelivre.gov.br. Retrieved 26 July 2013. ^ Guillemin, Christophe. "La gendarmerie nationale passe à OpenOffice" (in French). ZDNet. Retrieved 3 May 2014. ^ Finley, Klint. "French National Police Switch 37,000 Desktop PCs to Linux". Wired. Retrieved 3 May 2014. ^ "Limerick city council increasingly turning to open source". ^ Shankland, Stephen (18 October 2011). "LibreOffice expands users and reach". ^ "DK: 25,000 hospital staff Copenhagen region to use open source office suite". ^ "Greek municipality of Pilea-Hortiatis migrating to LibreOffice". ^ "Spain's Las Palmas' moves 1200 PCs to LibreOffice". ^ "Administration of the Italian region Umbria moving to LibreOffice". ^ "City of Largo, Florida | Infrastructure Division". Largo.com. Retrieved 27 February 2013. ^ "LibreOffice Office Suite: Microsoft Losing International Ground To Open Source Migrations". Dailyflux.com. 24 November 2012. Retrieved 27 February 2013. ^ Henning, Edward (21 June 2013). "South Tyrol government to standardise on LibreOffice". The H Open. Heinz Heise. Archived from the original on 8 December 2013. Retrieved 23 June 2013. ^ Hillenius, Gijs (22 August 2013). "Valencia region government completes switch to LibreOffice". Joinup. Retrieved 4 January 2014. ^ "Munich shifts to LibreOffice". ITworld. 17 October 2013. Retrieved 2 February 2014. ^ "Toulouse saves 1 million euro with LibreOffice". Joinup. 2014-07-23. Retrieved 2014-07-31. ^ "Moving to LibreOffice saves Toulouse 1 million". ^ "LibreOffice conference | Open Document". Opendocument.xml.org. Retrieved 20 September 2012. ^ "Welcome — LibreOffice Conference". Conference.libreoffice.org. Retrieved 4 August 2013. ^ "LibreOffice Conference 2014 Call for Paper". The Document Foundation. 5 March 2014. Retrieved 8 March 2014. ^ "LibreOffice Conference 2015 in Aarhus, Denmark, from September 23 to September 25, 2015". The Document Foundation. 17 October 2014. Retrieved 2 November 2014. In 2003-2004, the Brazilian corporation Serpro started migrating its software to BrOffice (the local version of LibreOffice at the time), with estimated value of BRL 3.5 billion (approximately US$1.2 billion at the time), and became a case study for similar initiatives in Brazil, particularly in e-government. In 2005, the French Military Police announced its migration to OpenOffice.org. It is currently migrating to a customised version of Ubuntu with LibreOffice (target for 2015: 72,000 desktop machines). In 2010, the Irish city of Limerick gradually started migrating to open-source solutions to free itself from vendor lock-in and improve its purchase negotiation power. One of the key aspects of this move has been the use of LibreOffice. In 2011, the administrative authority of the Île-de-France region (which includes the city of Paris) included LibreOffice in a USB flash drive given to students which contains free open source software. The USB flash drive is given to approximately 800,000 students. In 2011, it was announced that thirteen hospitals of the Copenhagen region would gradually switch to LibreOffice, affecting "almost all of the 25,000 workers". In 2012, the Greek city of Pylaia-Chortiatis migrated its PCs to use LibreOffice. The local Linux User Group estimated cost savings to be at least 70,000 euros. In July 2012, the Spanish city of Las Palmas switched its 1200 PCs to using LibreOffice, citing cost savings of €400,000. In 2012, the administration of Umbria, Italy, started a project to migrate an initial group of 5000 civil workers to LibreOffice. In June 2013 the government of the Italian province of South Tyrol will be switching 7000 PCs in administration and "many more thousands" of PCs in health services using LibreOffice and ODF. In August 2013, the administration of the Spanish autonomous region of Valencia has completed the migration of all 120,000 PCs of the administration, including schools and courts, to LibreOffice. In 2013, the German city of Munich announced that it would transition from OpenOffice to LibreOffice in the near future. This is in line with Munich's long term commitment to using open source software. Munich uses LiMux, an Ubuntu Linux derivative, on nearly all of the city's 15,000 computers. In 2014, the French city of Toulouse announced it saved 1 million euro by migrating thousands of workstations to LibreOffice. The Document Foundation has set a target of 200 million users worldwide before the end of 2020. The Document Foundation estimated in September 2011 that there were 10 million users worldwide who had obtained LibreOffice via downloads or CD-ROMs. Over 90% of those were on Windows, with another 5% on Mac OS X. LibreOffice is the default office suite for most Linux distributions, and is installed when the operating system is installed or updated. Based on International Data Corporation reckonings for new or updated Linux installations in 2011, The Document Foundation estimated a subtotal of 15 million Linux users. This gave a total estimated user base of 25 million users in 2011. In September 2013, after two years, the estimated number of LibreOffice users was 75 million. A million new unique IP addresses check for downloads each week. 3.x Old version, no longer supported: 3.3 beta 28 September 2010 Initial release based on ooo-build; 80,000 downloads. Improved GTK+ theme integration and font rendering in Linux. AES encryption support for ODF file encryption. Improved Office Open XML support. Introduction of an online update checker. By default, this feature is not fully automated. This was the last version to support Windows 2000. Basic implementation of EMF+ metafiles. Import of legacy Mac text formats (Write Now, MacWrite Pro, AppleWorks) . Layout via Core Text for OSX and HarfBuzz for Linux. New set of monochrome icons, "Sifr"
Libreoffice 4.3 showing the updated tango icon set. It is possible to connect to OneDrive and SharePoint 2010/2013 directly from LibreOffice. LibreOffice 4.4 adds the libre-licensed Caladea and Carlito fonts (Huerta Tipográfica). Caladea and Carlito have the same metrics and proportions as Microsoft's Cambria and Calibri, respectively, so they can be used as drop-in replacements. LibreOffice uses a time-based release schedule for predictability, rather than a "when it's ready" schedule. There has been a major release approximately every four to eight months, with the intention to do so every six months (eventually in March and September, with the intention of aligning it with other free software projects). A minor bugfix version of the current and some previous release branches is released each month. "Still", formerly "Stable" (catering to users who prefer stability) to signal their appropriateness for differing user profiles. As of July 2013, the advisory board of The Document Foundation has 11 members: AMD, Google, Red Hat, SUSE, Intel, Lanedo, King Abdulaziz City of Science and Technology (KACST), Inter-Ministry Mutualisation for an Open Productivity Suite (MIMO), Free Software Foundation (FSF), Software in the Public Interest, and Freies Office Deutschland e.V. By 2013, the founding aims of The Document Foundation were achieved. Hosting infrastructure had been set up and enlarged to cope with increased demand. The Document Foundation was officially set up as a German non-profit foundation. In June 2011, Google, Free Software Foundation, Red Hat, SUSE, Software in the Public Interest and Freies Office Deutschland e.V. each contributed one representative to The Document Foundation's Advisory Board to serve for an initial term of one year. Timeline of major derivatives of StarOffice and OpenOffice.org. LibreOffice is in green. The act of creating The Document Foundation and its LibreOffice project did no demonstrable harm to Oracle's business. There is no new commercial competition to Oracle Open Office (their commercial edition of OO.o) arising from LibreOffice. No contributions that Oracle valued were ended by its creation. Oracle's ability to continue development of the code was in no way impaired. Oracle's decision appears to be simply that, after a year of evaluation, the profit to be made from developing Oracle Open Office and Oracle Cloud Office did not justify the salaries of over 100 senior developers working on them both. Suggesting that TDF was in some way to blame for a hard-headed business decision that seemed inevitable from the day Oracle's acquisition of Sun was announced is at best disingenuous. denies this is the case: Simon Phipps But former Sun executive .Contributor License Agreement that it would donate the OpenOffice.org code and trademark to the  In June 2011, Oracle announcedOracle announced in April 2011 that it was ending its development of OpenOffice.org and would lay off the majority of its paid developers. It was originally hoped that the LibreOffice name would be provisional, as Oracle was invited to become a member of The Document Foundation. Oracle rejected requests to donate the OpenOffice.org brand to the project and demanded that all members of the OpenOffice.org Community Council involved with The Document Foundation step down from the OOo Community Council, citing a conflict of interest. LibreOffice 3.3 beta used the ooo-build build infrastructure and the OpenOffice.org 3.3 beta code from Oracle, then adding selected patches from Go-oo. Go-oo was discontinued in favour of LibreOffice. Since the office suite that was branded "OpenOffice.org" in most Linux distributions was in fact Go-oo, most moved immediately to LibreOffice. On 28 September 2010, OpenSolaris. Sun's contributions to OpenOffice.org had been declining for some time, they remained reluctant to accept contributions and contributors were upset at Sun releasing OpenOffice.org code to IBM for IBM Lotus Symphony under a proprietary contract, rather than under an open source licence. Linux distributions and was contributed to by said distributions. and put forward a more detailed proposal in 2001.